A global super-rich elite has exploited gaps in cross-border tax rules to hide an extraordinary $NZ25tn of wealth offshore – as much as the American and Japanese GDPs put together – according to research commissioned by the campaign group Tax Justice Network. He shows that at least $NZ25tn – perhaps up to $NZ39tn – has leaked out of scores of countries into secretive jurisdictions such as Switzerland and the Cayman Islands with the help of private banks, which vie to attract the assets of so-called high net-worth individuals. Their wealth is, as Henry puts it, “protected by a highly paid, industrious bevy of professional enablers in the private banking, legal, accounting and investment industries taking advantage of the increasingly borderless, frictionless global economy“. According to Henry’s research, the top 10 private banks, which include UBS and Credit Suisse in Switzerland, as well as the US investment bank Goldman Sachs, managed more than $NZ7.7tn in 2010, a sharp rise from $NZ3.9tn five years earlier. The detailed analysis in the report, compiled using data from a range of sources, including the Bank of International Settlements and the International Monetary Fund, suggests that for many developing countries the cumulative value of the capital that has flowed out of their economies since the 1970s would be more than enough to pay off their debts to the rest of the world. 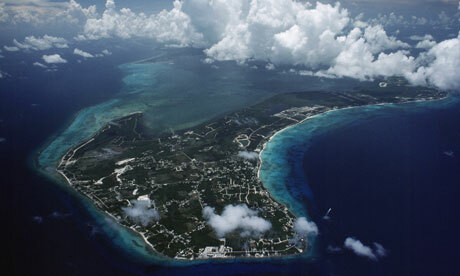 Oil-rich states with an internationally mobile elite have been especially prone to watching their wealth disappear into offshore bank accounts instead of being invested at home, the research suggests. Once the returns on investing the hidden assets is included, almost $NZ973bn has left Russia since the early 1990s when its economy was opened up. Saudi Arabia has seen $NZ383bn flood out since the mid-1970s, and Nigeria $NZ381bn. “The problem here is that the assets of these countries are held by a small number of wealthy individuals while the debts are shouldered by the ordinary people of these countries through their governments,” the report says. The sheer size of the cash pile sitting out of reach of tax authorities is so great that it suggests standard measures of inequality radically underestimate the true gap between rich and poor. According to Henry’s calculations, $NZ12.2tn of assets is owned by only 92,000 people, or 0.001% of the world’s population – a tiny class of the mega-rich who have more in common with each other than those at the bottom of the income scale in their own societies. TUC general secretary Brendan Barber said: “Countries around the world are under intense pressure to reduce their deficits and governments cannot afford to let so much wealth slip past into tax havens. Assuming the $NZ25tn mountain of assets earned an average 3% a year for its owners, and governments were able to tax that income at 30%, it would generate a bumper $NZ235bn in revenues – more than rich countries spend on aid to the developing world each year. Groups such as UK Uncut have focused attention on the paltry tax bills of some highly wealthy individuals, such as Topshop owner Sir Philip Green, with campaigners at one recent protest shouting: “Where did all the money go? He took it off to Monaco!” Much of Green’s retail empire is owned by his wife, Tina, who lives in the low-tax principality. Leaders of G20 countries have repeatedly pledged to close down tax havens since the financial crisis of 2008, when the secrecy shrouding parts of the banking system was widely seen as exacerbating instability. But many countries still refuse to make details of individuals’ financial worth available to the tax authorities in their home countries as a matter of course. Tax Justice Network would like to see this kind of exchange of information become standard practice, to prevent rich individuals playing off one jurisdiction against another. “The very existence of the global offshore industry, and the tax-free status of the enormous sums invested by their wealthy clients, is predicated on secrecy,” said Henry. The world economy may still be in the doldrums, but global wealth continues to grow, hitting an all-time high this year of $231 trillion, according to a new global wealth report from Credit Suisse. And more than ever, that figure is concentrated at the top of the pile. A mere 0.5% of the world’s population owns an eye-popping 38.5% of its total wealth. As protests against the “1%” continue to rage on in downtown Manhattan and cities across the globe, we’re taking a look at how wealth is distributed and which countries are increasing their share of the world’s richest people. The charts are from Credit Suisse’s 2011 Global Wealth Report. Click here to download the full report. 0.5% of the world’s population owns 38.5% of its wealth. The bottom two-thirds account for just 3.3% of wealth. The graph shows which continents comprise different wealth deciles. Developed markets clearly dominate the top 10%. Wealth inequality in Africa is so high that while almost half of African adults are in the bottom two wealth deciles, some individuals are still in the top 1%. China, India, Latin America and Africa account for 56% of the world’s population, but just 16% of its wealth. The U.S. is home to 21% of people who have more than $100,000 in wealth. Japan is home to 16%. The numbers are even more concentrated when you look at millionaires. One-third of the world’s millionaires live in the U.S. Sweden and Switzerland each have 2% of global membership, but a much smaller fraction of the global population. The number of ultra-high net worth individuals is growing, due, in part, to the fact that “the past decade has been especially conducive to the establishment of large fortunes,” according to Credit Suisse. This year, Europe surpassed the U.S. in terms of the number of high-net worth residents (who own between $1 million and $50 million). In terms of ultra-high net worth individuals (with net assets above $50 million), the U.S. still dominates. It’s home to 42% of the group. 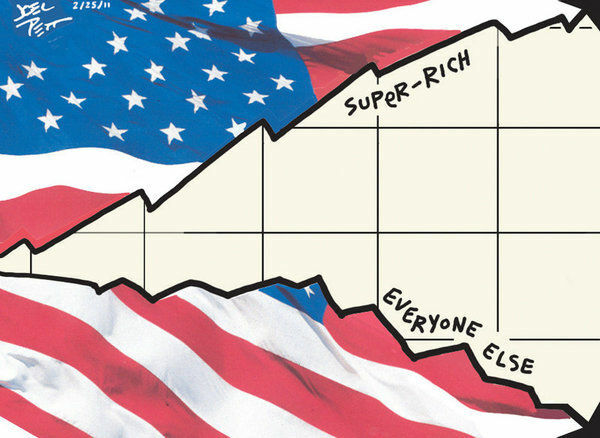 The U.S. is home to 32% of the world’s billionaires and 41% of people whose net worth exceeds $10 million. China’s share is increasing. The number of millionaires in China is expected to double between now and 2016. This entry was posted in Business, Economics, New Zealand, Parody, Politics, Social Commentary and tagged Disparity of Wealth, Economics, Equality, Fiscal Equality, Mega-Rich, Money, Poor, Super-Rich, Tax Havens, Wealth distribution. Bookmark the permalink.